My third ground of 2019 was on Tuesday 22nd January at Homers Heath in Newton Abbot, Devon. 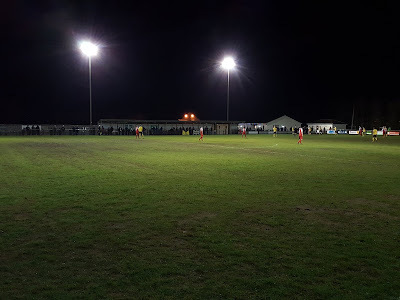 The match was Buckland Athletic vs. Cadbury Heath in the Western League Premier Division. Homers Heath is located in a rural area between the towns of Newton Abbot and Kingkerswell. The road to the ground runs alongside its eastern flank with the site surrounded by fields and trees on all sides. There is an additional grass area behind the southern side which is used for training and pre-match warm-ups. The venue is 1.5 miles south of Newton Abbot and its train station. The club have had four different homes since forming in 1977 with the current ground at Homers Heath becoming their home in 2005. The north-east corner to the ground is where the entrance turnstiles are situated and in this area is a nice spacious clubhouse which has a bar inside and a snack outlet facing outwards. The exterior has a a decked area with picnic benches as well as a separate building for toilets. The players dressing rooms are in the clubhouse with the players emerging out between this building and the toilet building. In terms of spectator areas the northern side is hard standing for its length with a covered wood and metal section from the halfway line towards the eastern end. This structure has nine supporting beams to hold up the roofing but these are thin so do not impede views if standing at the front. Behind this side is a decent sized car park, a requirement given the lack of any on-street parking in the vicinity. The main stand, the Clive Holmes Memorial Stand, is on the southern side of the venue by the halfway line. This 160 seat stand is built into the natural grass bank and has designated areas for press, officials and sponsors. There are four supporting beams as well as a floodlight directly in front of the stand so there is a little bit of view restriction in some seats. The two dugouts are in front of the stand and the rest of this side is uncovered hard standing. The eastern and western ends are near identical with hard standing areas for their length with flat grass sections behind. Buckland got off to a quick start opening the scoring in only the 2nd minutes of the game. There was some nice interplay on the edge of the area before the ball was squared to the centre of the penalty area. Cadbury Heath failed to clear and the ball broke to Rich Groves who steered it into the bottom corner. 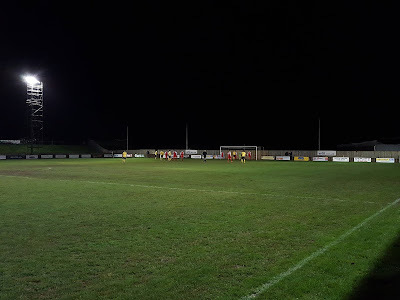 The visitors started the game on the backfoot and almost went two goals behind in the 7th minute when a ball across from the left was cleared on the line. The ball then broke to Charlie Johansen who collided with away keeper Matt Semple and in the chaos Groves smashed wide when he should have notched up his second of the game. A couple of minutes later a free-kick from the right found Tony Radford free in the Cadbury Heath box but he headed over. With Buckland all over the away side it was no surprise to see goal number 2 arrive in the 19th minute. Home goalie Kenny Griffiths launched a long punt upfield, a defender missed an attempted clearance letting Lloyd Gardner in on goal. Gardner rounded Matt Semple and slotted into the bottom corner. The third goal arrived in the 33rd minute as a cross from the right was knocked home by Charlie Johansen in the six yard box. Buckland seemed to take their foot off the gas a little after this and Cadbury had their first chance of the match a minute later when Griffiths palmed over the goalbound header from a corner. The visitors had a decent spell in the ascendancy and this continued after the half-time interval. 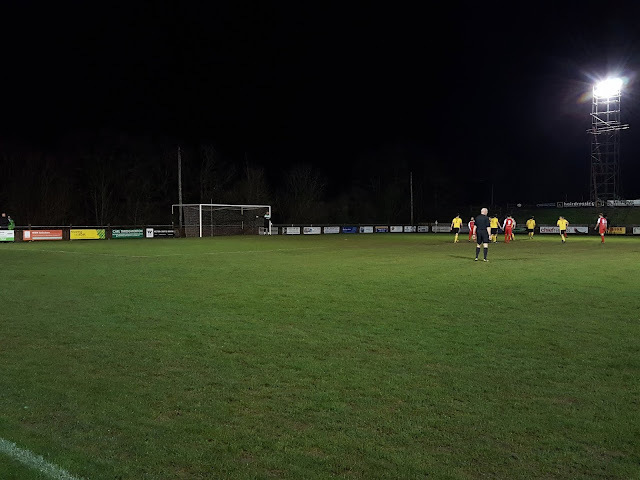 The game was well contested during this time with Cadbury going close in the 55th minute with a spectacular volley from the left side of the box going just over the bar. For their part Buckland almost netted from a scramble from a corner on the hour-mark with the ball being poked just the wrong side of the post. In the 76th minute the home side scored a fourth as Lloyd Gardner picked up a short corner and went on a mazy run before shooting low into the corner from 20 yards. This goal was the start of a capitulation by the away side and they conceded another three times before the night was over. The fifth goal came in the 82nd minute with Gardner turning provider this time. He produced a lovely dinked pass to Nick Rudge on the left side of the area and he controlled the ball before picking out the bottom corner of the net. 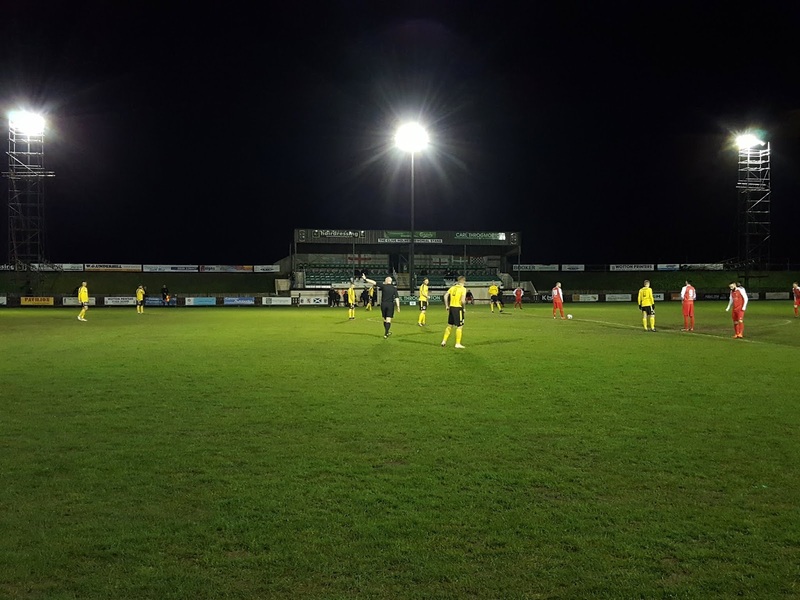 In the 86th minute the Cadbury defence went missing as a ball down the left found James Moxon and he advanced into the area before curling an excellent finish into the top corner from 15 yards. A minute before the end of the ninety minutes Lloyd Gardner grabbed his hattrick, helped by Cadbury trying to play offside. When they all moved up Gardner ghosted in and lifted the ball over the advancing Semple to finish the scoring. 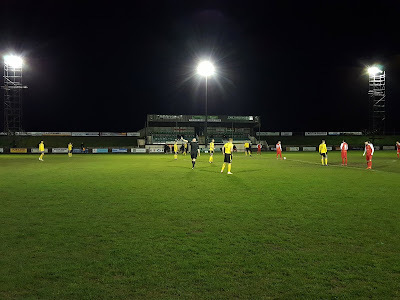 The scoreline was possible a little harsh on a depleted Cadbury Heath side but their competitive showing in the middle of the game was undermined by an awful start and an awful finish for which they were mercilessly punished.